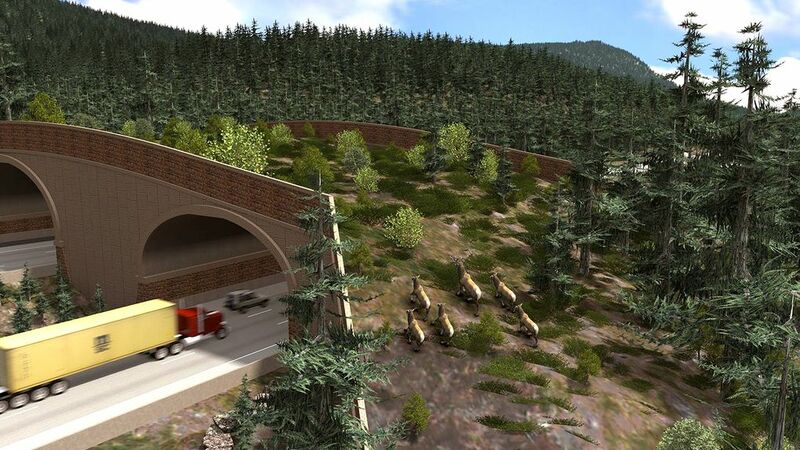 The state will break ground Tuesday on Washington’s first wildlife overpass to provide safe passage for bear, elk, foxes and other animals over Interstate 90 east of Snoqualmie Pass. Interstate 90 is a lifeline for the Northwest, connecting people and economies across the Cascades and linking the region to the rest of the country. For wildlife, though, it’s a killer — and not just because many of them wind up squashed. Multiple lanes of pavement and high-speed traffic bisect habitat more ruthlessly than any fence, isolating populations and undermining the genetic vigor that’s key to long-term survival. But part of that barrier is now being lifted. On Tuesday, the state Department of Transportation broke ground east of Snoqualmie Pass on the state’s first freeway overpass for animals. The 150-foot-long structure is designed to provide safe passage for species ranging from black bear and cougar to deer, elk — and even squirrels, mice and lizards. It’s part of an ambitious project to convert a 15-mile stretch of interstate into one of the world’s most wildlife-friendly highways. When finished, the section of I-90 from Hyak to Easton will incorporate more than 20 major underpasses and overpasses engineered partly or wholly with wildlife in mind. Dozens of small culverts will also be rebuilt to allow easier passage. 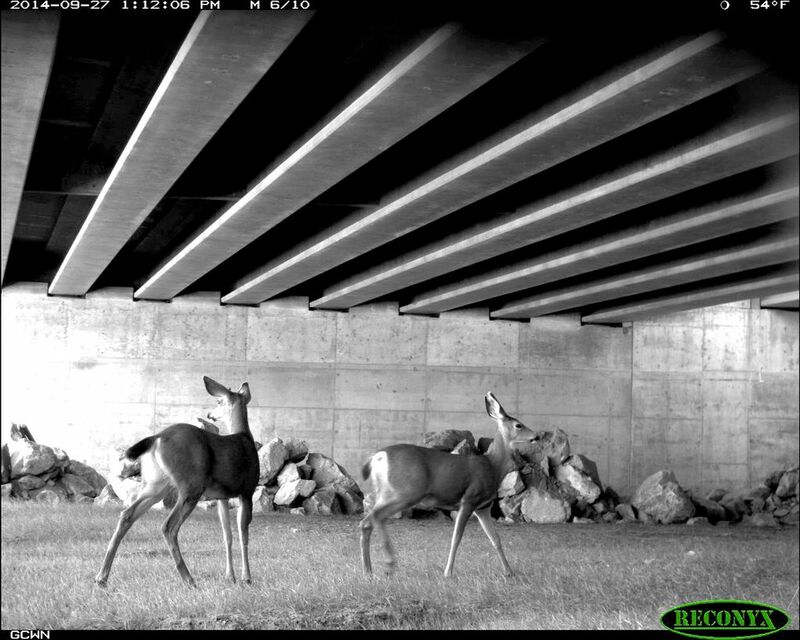 Four new underpasses are already open, and cameras are capturing images of deer, ducks, coyotes and river otters moving through. “We think this is going to make a lot of difference for wildlife,” said WSDOT project manager Brian White. 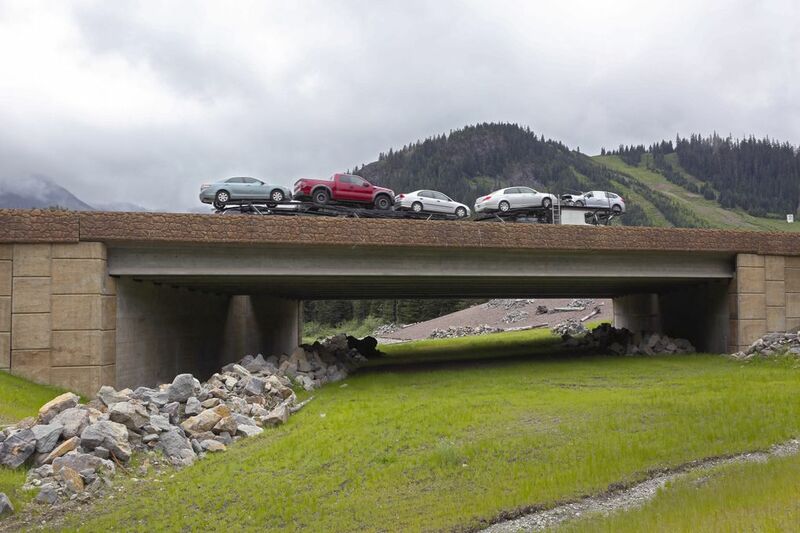 The wildlife structures are being piggybacked on a nearly $1 billion project to widen I-90 from four lanes to six, straighten curves, reduce avalanche hazards and generally improve driving conditions on one of the nation’s busiest mountain highways. Some 28,000 cars traverse Snoqualmie Pass on an average weekday, and the number can more than double on sunny weekends. Except for reducing collisions with vehicles, animals weren’t especially high on WSDOT’s priority list when the agency started planning the expansion more than 10 years ago. But restoring connections between wildlife populations in the North and South Cascades is a long-term goal for the U.S. Forest Service, which owns the right of way. The area is also of keen interest to conservation groups that toiled for decades to eliminate a historic checkerboard pattern of timber ownership and bring almost 100,000 acres back into federal management. Vast swaths of federal land are the main reason Washington is blessed with such robust wildlife populations, Garvey-Darda pointed out. “It’s contiguous forest on both sides of the Cascade crest all the way from the Canadian border down to Oregon.” But I-90 slices through the heart of that forest. That can cause problems, especially for big predators like cougars and bears, that require expansive territories. It can also hinder recovery of rare species like wolverines and pine martens, for whom mates are already in short supply. And for all species, isolation can reduce the genetic diversity that helps populations survive disease outbreaks, shifting climate and other environmental turmoil. Though the genetic well-being of bobcats or tailed frogs isn’t WSDOT’s mandate, it was clear that the I-90 project wouldn’t happen unless the Forest Service and conservation community were on board, White said. From an engineering standpoint, it wasn’t that tricky to lengthen bridges to create expansive undercrossings and enable streams and wetlands to meander naturally, White said. The old bridge at Gold Creek, near milepost 55, was only 150 feet long and surrounded by embankments that few animals could navigate. The new version, which was finished last year, includes a 1,100-foot span that allows the creek to flow freely underneath and provide upstream passage for fish, like bull trout. The expansive opening also preserves wetlands and opens up a natural flood plain for Keechelus Lake. A separate undercrossing provides year-round passage for land animals, even when the lake is high. Gold Creek and other underpasses will all be planted with native vegetation, to blend seamlessly with the surrounding environment. Tangles of wood and piles of rock scattered under the Gold Creek bridges serve as avenues and hiding places for small creatures, like pikas, voles, shrews and snakes. Tweaking bridges to accommodate wildlife may not be much of a stretch for a transportation agency, but building freeway overpasses strictly for wildlife is unprecedented in Washington. 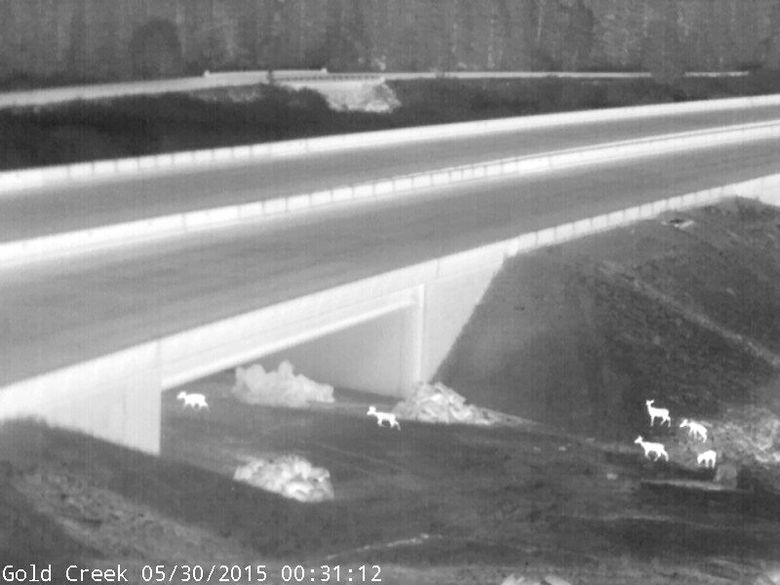 (King County built a wildlife overpass on N.E. Novelty Hill Road, near Redmond.) The I-90 plans call for at least two and perhaps more, if funding allows. The first will be located at Price Creek, just east of Keechelus Dam. The site was picked based on topography and monitoring that found the area is a natural wildlife corridor. Scheduled to open in 2019, the $6.2 million overpass will also be planted with native vegetation. Ideally, animals will stroll across undeterred by cars and trucks zipping past under their feet, White said. Similar structures are working well on U.S. 93 through the Flathead Indian Reservation in Montana, where 30 species have been documented making more than 20,000 transits a year. The world’s most extensive network of wildlife crossings is on the Trans-Canada Highway in Banff National Park, said Mike Sawaya, a biological consultant who has studied wildlife movements at several projects. Vehicles there used to slam into deer, elk and moose so frequently that the highway was called the “meat maker.” With a combination of fencing and 44 crossing structures, the collision rate dropped more than 80 percent. Sawaya and others found that it can take several years for some species, like bears, to get accustomed to using underpasses and overpasses. But once they do, he found that up to 20 percent of bears living around the roadway use them. 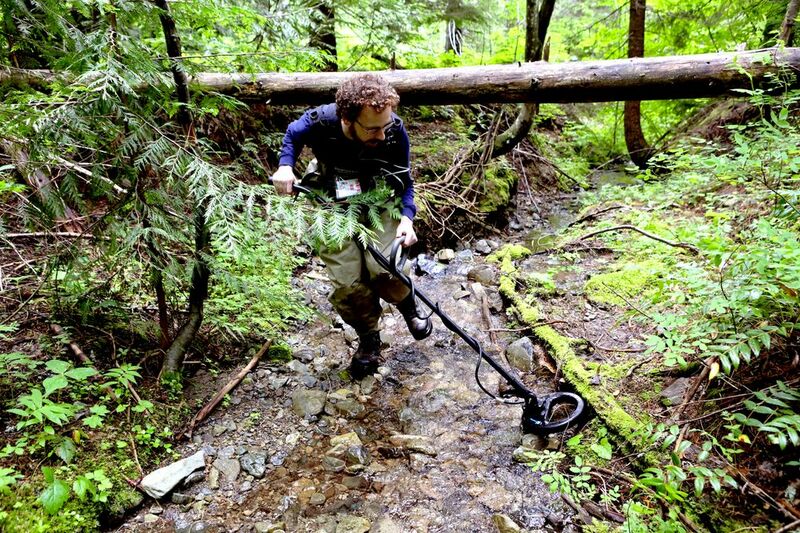 In one experiment, Sawaya strung single strands of barbed wire near the crossings to snag hair from grizzlies and black bears for DNA analysis. He discovered that many of the bears that crossed the road also bred once they got to the other side — thus boosting genetic diversity. Marcel Huijser of the Western Transportation Institute at Montana State University, has analyzed wildlife-crossing structures around the world, from elevated rope bridges for dormice in the U.K. to culverts in Brazil designed to keep 100-pound rodents called capybara off the road. Cost is always an issue, he said. But on roadways with a high rate of vehicle-wildlife collisions, he found that some types of crossing structures can actually result in savings, compared to the expense of vehicle damage and human injury. It’s not clear how that cost-benefit equation works out for I-90, with an average of four to five serious vehicle-animal collisions a year in the project area. It’s also hard to estimate how much the wildlife crossings add to the total cost, since all the bridges and culverts had to be replaced anyway, White said. The price tag for the first seven miles is $551 million, funded through a gas tax imposed by the Legislature in 2005. WSDOT estimates it will cost an additional $390 million, which hasn’t been budgeted yet, to complete the final eight miles. On the wildlife side of the ledger, researchers from Central Washington University have been monitoring creatures great and small along the corridor for several years. The goal is to gather baseline data before construction, then quantify the impact of the crossing structures, which are also monitored via camera. 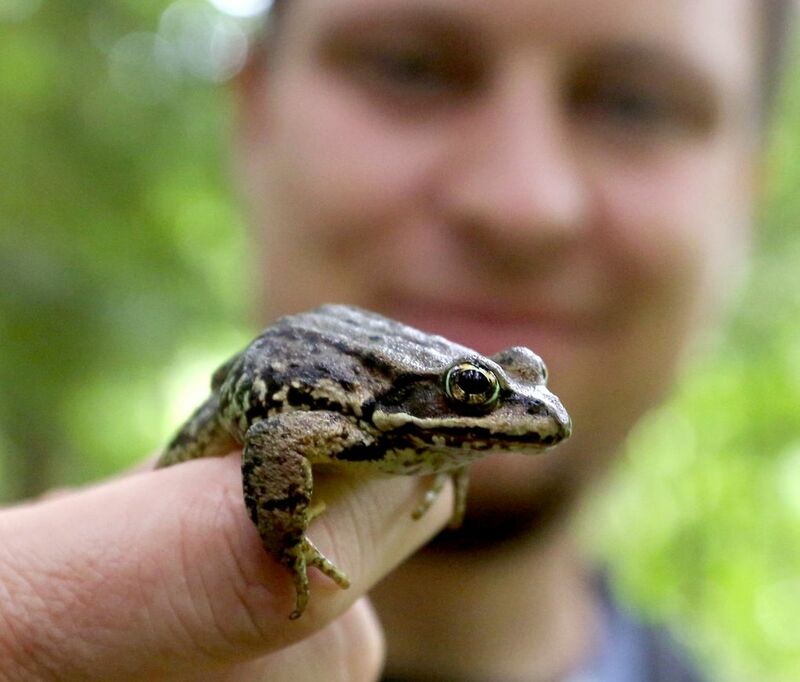 It’s early days, but the signs are promising, said CWU graduate student David Reavill, who’s tracking and tagging frogs and salamanders. Individual amphibians may not travel far in their lifetimes compared to elk or cougars, but that doesn’t mean they won’t make use of the crossings, he said. At Rocky Run Creek, where an impassable culvert was torn out and the streambed restored, salamanders have already taken up residence across the entire area.